1. To diverge or deviate from what is expected by someone or those who are supposed to be doing something: Henry's severe headache was the result of his having aberrated from his commitment to staying sober. Carl decided to aberrate from the usual route to his farm when he took a side road. Allison was aberrating from her normal work schedule so she could attend a concert in the evening. 2. To produce something that is not considered to be normal or proper: When Claudia aberrates from her usual piano-practice schedule, her musical performance is never up to its normal standard. The chemist accidentally mixed up the wrong chemical formula and therefore aberrated a very bad odor in the laboratory. 1. A wandering or straying away; a departure or deviation from what is considered normal or from the socially recognized path: The horror novel was considered an aberration as far as the tastes of the reading public were concerned. The new rules of the club were confusing and full of aberrations. 2. A defect in a lens or mirror, causing a distorted image or one with colored edges: The blurred photographs indicate that Ron's camera has a lens with an aberration. The flaw in a lens that doesn't focus properly is called a spherical aberration. 3. In astronomy, a small periodic change in the apparent position of a star or other astronomical object, caused by the motion of the earth around the sun: The astronomer noticed an unusual aberration in the constellations of the Northern Hemisphere. In astronomy, an aberration is an apparent displacement in the position of a celestial object as a result of the time it takes for light from the object to reach an earthbound observer and to the orbital motion of the earth during that time. 4. A disorder or abnormal alteration in one's mental state: Three authors got together to see how many aberrations they could include in the Worst Novel of the Year. The only aberration that Marcia's mother has is an occasional lapse of memory. 1. A partial removal or an abnormal departure (leaving a place), that is either excessive or deficient: In the time of the flood crisis, Louis may have been too slow in undertaking the abevacuation of his farm animals to higher ground. The fire fighters were experienced in managing abevacuations under critical circumstances. 2. Dislodgment, or removals, through abnormal channels: Some grave diggers performed abevacuations at night. The abfarad was named after the English physicist Michael Faraday who contributed to the study of electromagnetism, the physical interaction that occurs between electrically charged particles; and electrochemistry, the branch of physical chemistry that studies the relationship between electricity, as a measurable and quantitative phenomenon, and identifiable chemical changes. Michael Faraday (1791-1867) was an English experimental scientist who was especially noted for his discoveries in electricity, including electromagnetic induction, the battery, the electric arc, and the dynamo or an electrical generator that produces direct current. Abhenry is a medical term referring to the centimeter-gram-second electromagnetic unit of inductance, equal to 10-9 or one billionth of a henry (a standard unit of inductance in the meter-kilogram-second system), equivalent to that of an induced 1 volt in the presence of a current that is changing at a rate of 1 ampere per second: When the scientists met, they exchanged notes about their theories of various applications of abhenries. The term, abhenry, was named for Joseph Henry (1797-1878), a U.S. scientist who discovered the electromagnetic phenomenon of self-inductance, and who also discovered mutual inductance, independently of Michael Faraday. His work on the electromagnetic relay was the basis of the electrical telegraph. 1. To shrink away from in fear, disgust, or hatred; to detest, to hate, to despise: Toby, the cat, abhors the sounds of fog horns because they hurt his ears. Jeremy abhorred putting off the completion of the project. 2. To disapprove of or to reject something very strongly; to recoil from, or to shudder at: Kay's neighbor has always abhorred loud music because it causes him to have severe headaches. The family abhors the very thought of having to move again. Ariana abhorred the mosquitoes that were breeding in the rain barrel by her garage. 3. To loathe or to detest: Anyone devoted to democratic ideals must abhor the idea of making distinctions on the basis of religion or race. Dr. Emmett abhors people who are habitually late for medical appointments. 4. 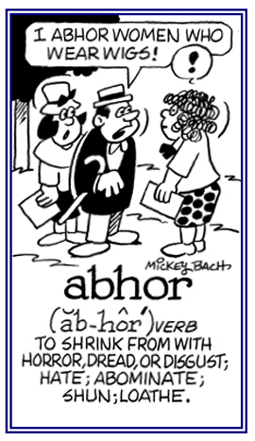 Etymology: from Latin abhorrere, "to shrink back from, to have an aversion for, to shudder at"; from ab-. "away" + horrere, "to tremble at, to shudder"; literally, "to bristle, to be shaggy". 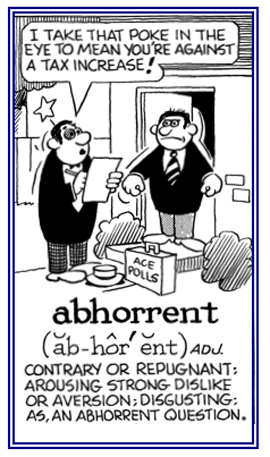 The Romans used the stronger term of abhor instead of milder forms of detestation (strong dislike or hatred), just as people do now in modern times. Detested, hated: Stephen refused to take part in the meeting with that abhorred guy who never took a bath. The abhorred smell from the open sewer was offensive and finally caused the local government to make some public health improvements. 1. Someone or something that is strongly or intensely disapproved of: Gertrude had a strong abhorrence of mice running around in her basement during the winter; so, she set a lot of traps to kill them. 2. That which is disgusting, loathsome, or repellent: The first mate on the ship had an abhorrence for the smell of the water in the bilge. Mary has an abhorrence of monster movies. 3. A feeling of repugnance, revulsion, or loathing about someone or something: Tom's multiple abhorrences for reptiles and spiders will make it difficult for him to do much research when he goes to Africa next month. Such violence during the TV movie is an abhorrence to Jeremy. Some movies, even on TV, show too many abhorrences of beatings and killings of people! 1. Anything that arouses strong feelings of repugnance or disapproval about people, situations, or things: Even thinking about failing was an abhorrent idea for Scott to consider. Ronald's sister had an abhorrent dislike of insects and other "creepy things" which helped to determine the direction of her scientific studies. 2. Incompatible with or conflicting with something: The abhorrent violence at the start of the film was so disgusting and loathsome that the couple got up and walked out. 3. Abominable, repugnant, or despicable: The man committed an abhorrent crime when he killed his wife. 4. Unacceptable or strong dislike: The thought of not being successful with his performance at the tennis match was abhorrent to the player. 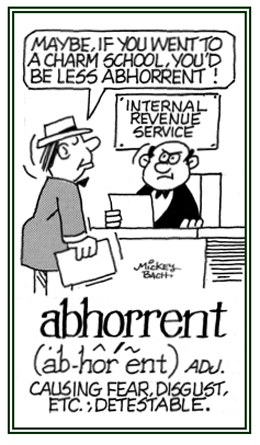 The spelling of abhorrent shows that it is related to "horror". It means "feeling horror", when it is used with "of": Niki was so abhorrent of snakes that she would almost faint if she simply saw one. When abhorrent is used with "to", it is expressed as: Crystal's casual disregard for the truth was abhorrent to her father's moral values. When abhorrent means "creating horror, detestable", then it is written as: The sight of the abhorrent bleeding and injuries particularly upset Latricia when she saw those who were so terribly hurt in the car accident. © ALL rights are reserved. A description of intense disapproval or dislike of something: There was something abhorrently unacceptable and vulgar about Elsie's behavior at the party last night. The supervisor's abhorrently despicable behavior after work was in contrast to his normally mild demeanor while he was working, which made his fellow workers think of him as a Dr. Jekyll and Mr. Hyde character. Someone who regards others, or certain things, with extreme repugnance: The prison guard was an abhorrer of those who attempted to escape. Mark was an abhorrer of all things violent and harmful. The two clergymen were abhorrers of the extreme poverty in which many of their congregational members lived. 1. Diminishing discomfort or irritation with a soothing medication: The doctor prescribed an abirritant cream for the rash on Tamara’s arm. 2. Relieving or lessening irritation; soothing: When Larry went home, he applied some abirritant lotion which helped to sooth the itching on his back. After Dennis had finished his shower, he applied some more abirritant cream to the itchy places on his feet. Using the ointment provided the most abirritant sensational effects for Joe's sore foot. 1. To diminish the sensitivity of; to weaken: A good hand lotion will help to abirritate the dryness of a person's hands. Rocking baby Lillie abirritates her distress and helps her to sleep better. 2. To make less irritable; to soothe: The new ointment really abirritated the dryness of Jackie's hands very quickly. Walking through the woods and listening to the birds abirritate and relax Jim so he can think more clearly. Ken played soft music to abirritate his baby who was upset by the constant sound of the dog's barking. 1. Diminution or abolition of irritability in a body part: A good meal and pleasant background music are abirritations that really sooth Ida's irritations and bad temper. 2. A lack or loss of strength and energy; weakness: Being ill for several weeks brought about a general abirritation in Frank's sister that made her listless and sad. 1. Pertaining to the most contemptible kind, despicable; a situation that is miserable or hopeless: The soldier deserted like an abject coward. Walter's aunt was in an abject mood brought on by the secret knowledge that her hero was in fact an abject coward with feet of clay. The old couple have been living in abject poverty since their pensions were reduced. 2. Of the most miserable kind, wretched; the absolute worst or most extreme: Since the flood, Kristin's friends have been living in an abject situation as they try to clean up the mud in their house, get rid of and replace furniture that can no longer be used, and fix other damages done to their house. Tracie and her two children have been trying to survive in her old car for over a month under the most abject conditions; including being without toilet facilities, not having enough food or water, etc., etc. 3. 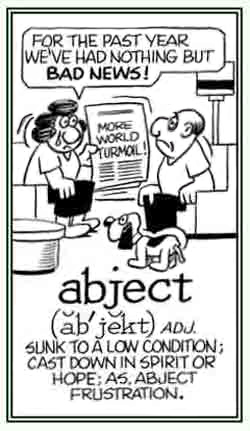 Etymology: a transition from the literal to the figurative, and from cause to effect, has occurred in the meaning of abject. 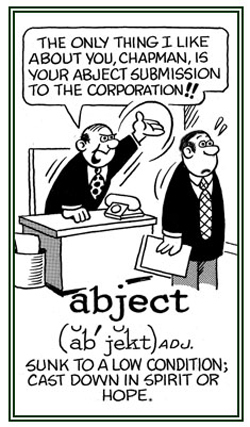 ab-, meaning "off, away", and jacere, meaning "to throw", were combined in Latin to form abjicere, "to throw away", with a past participle abjectus, "thrown away". Directly from this source came the English word abject, which was formerly not only an adjective but also a verb meaning "to cast off, to throw down", and with a figurative application, "to degrade". It is this latter meaning that survives in the Modern English adjective abject which characterizes someone who has been cast off or degraded and who is therefore low in condition or cast down in spirit. G. & C. Merriam Company; Springfield, Massachusetts; 1933; pages 4 and 5. © ALL rights are reserved. 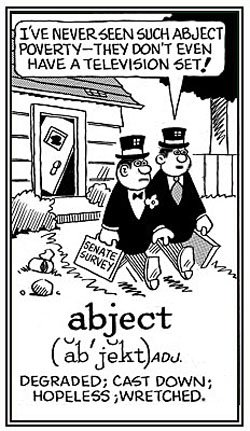 Showing page 3 out of 13 pages of 191 main-word entries or main-word-entry groups.